To understand the leadership imbroglio in the House of Representatives, the best thing to remember is: CHERCHEZ LES FEMMES. Two realities depressed me recently. I was in Buendia waiting for a PNR train to pass, but the train proved to be such a pitiful sight to behold---slow, old, dirty-looking, its green paint so faded. The decrepit train looked utterly incongruous with the gleaming skyscrapers of Makati and ritzy hotels. It chug-chugged and stopped to pick up passengers bound for Laguna and the Bicol region. In their current state PNR trains look more like fit for cattle and pigs. Hope springs in me that the PNR management would either consign that train to the graveyard or if there are no replacements as yet (public funds being squandered in Congress and elsewhere) at least the PNR would repaint its trains and always ensure that they be given a good scrubbing every morning before they roll out. With all the manpower available owing to the high level of joblessness in the metropolis, one would think the PNR management could harness a few dozen hands each morning to give its decrepit trains at least a decent scrub. One never sees trains looking so old and dirty in other countries. But more than a just some decent scrubbing, the best thing is to put those decrepit PNR trains away for good---perhaps in a museum for locomotives dating to the 19th century, or sell them to film companies doing movies on historical periods (I remember a great movie about WWII starring Alec Guinness, set in then Burma, with such a train carrying POWs). We sorely need efficient trains for the provinces but not in the sorry state of those PNR trains. When we see all those gleaming super-high speed trains in Japan and China and in Europe, then along comes those decrepit PNR trains, we find ourselves asking, what happened to our country? Inquirer columnist Cielito F. Habito recently pointed out that in a visit to Bangkok, he saw the headline story of an English-language newspaper about a large double-track railway system that the Thai government plans to build. Cielito admitted the story saddened him as "it showed how fast the Thais are moving to further upgrade their infrastructure, already far ahead of ours as it is." In PH we still ran pre-WWII decrepit and dirty trains through the 21st century Makati district. How did we arrive at this sorry state? Speaking of Bangkok I cannot help but reminisce on the excellent trains that capital city has maintained all along. One day while my husband was Philippine Ambassador to Cambodia in the late ‘90s, he decided to bring our family of three children for a few days’ trip to Vientiane, Laos. In Bangkok we boarded a second-class train with a sleeper coach and around 8 pm. our uniformed attendant began pulling out the sleeper beds and fixing the linens; we all slept comfortably. It was not any of those fancy trains, but it was clean and efficient. Why can’t we have something like those? Time was when extramarital affairs were whispered about in polite circles of power and tea parties, but never in the open---and certainly never on the front pages of newspapers. From front-page news accounts of the feud between Speaker Alvarez and his fellow Davaoeño and erstwhile bosom-buddy Rep. Antonio Floirendo in mainstream newspapers, these two members of the House are now bitterly locked in a personal and political quarrel that started because of the feud between their respective mistresses. Tonyboy Floirendo, son of the late “banana king,” is said to have been the major donor to the campaign of then presidential candidate and fellow Davaoeño Rodrigo Duterte, reportedly to the tune of P75 million. Floirendo is also credited with having helped his fellow Davaoeño, Bebot Alvarez, bag the speakership. But all that is over now between the best friends and Alvarez has raised the question of conflict of interest in the business actuations of Tonyboy Floirendo. The latter’s family business, the huge Tagum Agricultural Development Corp. (TADECO) which has been using vast lands leased from the Davao Penal Colony since 1969, renewed the lease in 2003 when Floirendo was already a congressman. Alvarez has referred the alleged the graft case to the Ombudsman. Whispers in the corridors of power, however, attribute the falling out between the erstwhile allies to the conflict involving their women. 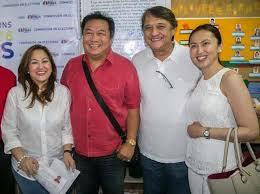 From Floirendo’s account, he and his common-law-wife Cathy Binag were approached by Alvarez’s estranged wife Emelita and their children, for help with regard to the Speaker’s womanizing. Binag and Alvarez’s mistress, Jennifer Maliwanang Vicencio, got into an altercation during a Bacolod festival and hostilities erupted. Rumors of a plot to remove the Speaker from his post, linking Floirendo, followed (which he denied) and Alvarez retaliated with the move to investigate TADECO. The feud between the two mistresses has resulted in the suddenly closure of the office of the Congressional Spouses Foundation, Inc. (CSFI) reportedly on orders of the Speaker’s mistress. Traditionally the CSFI is headed by the Speaker’s wife, but here the girlfriend is shown to be more powerful. I spoke to some wives of House members and they lamented this latest move against the CSFI, for it has been around since the days of Cecile Blanco Mitra, Speaker Ramon Mitra’s wife, and the spouses of succeeding speakers, such as Cynthia Villar and Sonny Belmonte’s daughter Joy have sustained its programs. Among the most notable projects of CFSI is the Lakbay Aral project whereby congressional spouses received stipends for their respective scholars. Another CSFI project is the “Haven for Abused Women” founded by Speaker Joe de Venecia’s wife, former Rep. Gina de Venecia, which thrives till today in Alabang. Reports say the CSFI’s office was closed down on orders of Speaker Alvarez’s girlfriend, who was quoted as saying that after all, the congressional wives don’t do anything but travel. There’s a bit of politics too, for after Vice President Leni Robredo indicated that she wanted to help the congressional spouses with projects, their office was closed. The scandal hitting Alvarez js not expected to peter out soon, for this burly rough top official seems used to playing hardball and he’s close to President Duterte, whose life mirrors the same predicament. Some pundits opine that if such scandal were to hit the US Congress, the official in question would be hard-put to resign. I can believe this, for while some of the American people may appear quite lax about enforcing moral standards in their private lives, public lives are demanded to be paragons of uprightness. Here the name of the game is thickening of one’s hide (kapalmuks). But women’s groups are speaking out. The militant Gabriela decried Speaker Alvarez’s “reckless generalization” that there would be no lawyer existing if such strident one-woman standards were to be applied. Other women’s groups decried Alvarez’s flaunting of his extramarital affairs as “something ordinary and acceptable,” as they stress that it “reeks of machismo unbecoming of a public servant, more so with the Speaker of the House." Shrugging It off as “something ordinary and acceptable” is a lamentable sign of the times we live in. Suddenly Mr. Duterte abandons impeach-Leni move---the wise general retreats to fight another day? But he’s still stuck on defense of PH claims in West Philippine Sea, where he can’t just 'hyperbole' with a jet-ski and plant the PH flag. As SC senior justice Carpio warns, China’s planting a radar station on Scarborough Shoal which will complete its radar coverage of entire South China Sea. 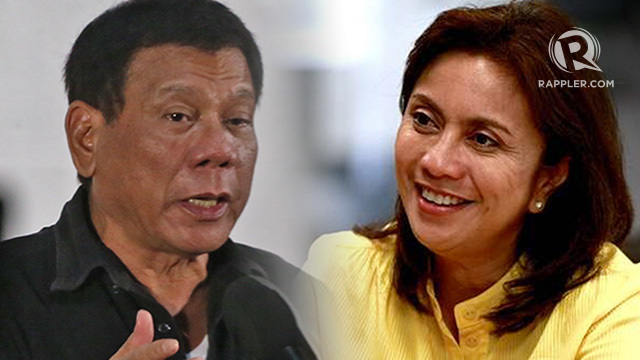 President Duterte suddenly took the wind out of the impeachment sail aimed directly against Vice President Leni Robredo by his staunch allies in Congress. Mr. Duterte suddenly was quoted today as saying that "Leni was just exercising her freedom of speech" when she criticized in a six-minute video tape submitted to the UN Commission on Narcotics Drugs in Vienna and played last March 16, his anti-illegal drug campaign that has seen more than 7,000 people dead in past months. With this news that the VP took the anti-drugs and EJK issue to the UN, his leaders were furious. Speaker Pantaleon Alvarez gathered House leaders to push for her impeachment, while Senate President Aquilino Pimentel III began pressuring the House leadership to send the complaint to his chamber to get the oust-Leni ball rolling. Why, even the Department of Foreign Affairs had the temerity to lecture the second highest official of the land---never before has this happened---that "there are limits to freedom of expression," and that this right |comes with the responsibility to ensure that facts are verified, and unfounded allegations from questionable sources are avoided." Tourism Secretary Wanda Teo reinforced administration allies as she, complained that Veep Leni’s pronouncements before the UN body “make it hard for us to sell the Philippines as a tourist destination.” Secretary Teo also pleaded with the media, “to please tone down reports on EJKs” even as she stressed during the President’s state visit to Thailand that PH is actually “a safe destination”---EXCEPT THAT JOURNALISTS ARE MAKING IT HARD TO SELL PH BECAUSE OF THEIR FOCUS ON DRUG-RELATED KILLINGS. There are several things to point out. One is that jeopardizing the image of the Philippines did not begin with VP Leni, for almost from Day One, President Duterte has displayed the propensity to counter-attack against people who even just gently criticize him---he just cannot brook criticism. Unfortunately, every attack he leveled against foreign leaders would be assiduously reported in foreign media. So why did the President retreated from the certainty of impeaching VP Leni Robredo when his House allies have the numbers? It’s good to remember that IMPEACHMENT IS ALL ABOUT NUMBERS. Thus ---though the House is fully controlled by Speaker Pantaleon Alvarez and he could get the numbers to impeach Leni, just as he got the votes to ram the death penalty through his chamber (217 pro death penalty, 54 against and one abstention in the House)--- IT'S A DIFFERENT BALLGAME ALTOGETHER IN THE 23-MEMBER SENATE. The LPs have a solid 10 votes there, so it's obvious that no matter what math is resorted to, Mr. Duterte would not get the 2/3 required vote (16 votes) in the Senate to oust Leni Robredo as Veep. I suspect that Digong’s conciliatory move toward Leni is very much related to the second impeachment complaint being proposed in the House---this time against himself, led by Magdalo party-list Rep. Gary Alejano. I suspect that the President’s most wary of appearing to the world as being impeached---bad for his strongman-image even if that move won’t prosper. All the turmoil (the impeachment of the two top leaders, albeit by different parties) would also be most hazardous for the country’s image abroad. So it had to be a QUID PRO QUO: he stops the impeachment of Leni in the House, so that he himself escapes impeachment in the Senate. MR. DUTERTE IS THE WISE GENERAL WHO RETREATS TO FIGHT ANOTHER DAY. When Senior Associate Justice Antonio told President Duterte recently to “defend” Panatag Shoal, no one in his right mind, most especially this learned jurist, would ever think of involving Filipino troops to fight for it. They’d be killed like flies with a fly-swatter on a summer day. Justice Carpio, who has long been looking into and speaking out on the issue of Chinese incursions into PH territory--- and how the Chinese are building various structures on our ocean islands in an effort to make a more realistic nine-dash line for them--- knew of course that defending the Shoal cannot mean doing it with our troops. The fight has to be carried out ON THE WORLD STAGE. AND IN THE ARENA OF INTERNATIONAL OPINION: PH has to bring this issue to various international forums where its claim has been upheld and seek to get allies to support our stand. Mr. Duterte knows this only too well but perhaps he’s just being stubborn. Neither would it help to hold him to his promise during the presidential campaign: that once-elected he’ll jet-ski to Panatag Shoal and plant the Philippine flag there. The jet-ski bit was Duterte hyperbole at its most colorful, but it clicked with the Filipino voters who gave him an unprecedented 16 million votes to capture Malacanang. But now that he’s President, Mr. Duterte can no longer hyperbole his way to our China problem’s resolution. He has to build up a consensus among Asian claimants to these China Sea waters and get their support for our cause, as it might someday be theirs too. First, there is the UN-backed Permanent Court of Arbitration in The Hague, where the Philippine claim to the contested islands in what’s called the "West Philippine Sea" was upheld last year. The logic of the UN Arbitral Court decision is simple: The Panatag Shoal is only 124 nautical miles from our nearest shore in Zambales, whereas it's easily over 250 nautical miles from Beijing. Moreover, these seas have been the traditional fishing grounds of our people since the dawn of civilization. Let’s build a consensus while PH heads ASEAN this year. Various countries in this regional grouping---e.g. Vietnam, Cambodia, Malaysia and Myanmar--- have claims as well to some of the islets in the vast ocean around us. PH should try to win them over vs. the big neighborhood bully up north. And perhaps there is more sympathy than we think. Last Saturday’s mass rallies prevented some folks from attending violinist Chino Gutierrez's beautiful soireé at Intramuros. Looking back at the interminable rallies we held 31 years ago to regain our democratic space, I wonder just how many hordes of folks had we inconvenienced as we marched endlessly up and down Ayala Avenue in those years? The Inquirer headlined last Sunday a “Nation Divided” as it showed two rallies that simultaneously went on in the capital city. One was the remembrance of the EDSA “People Power Revolution” of 31 years ago that brought down the dictator Ferdinand Marcos and the other rally, a gigantic one clear across at the Luneta, was Pro-Duterte and an impressive counter to the EDSA rally. Over three decades later the nation is still debating in various forums the relevance of the EDSA Revolution and there’s palpable effort to rewrite history---historical revisionism---and burnish the tarnished image of the dictator and his heir. To the simple folk the mass rallies were daunting as they coped with traffic and the inconvenience reminiscent of all the mass movements 31 years ago. A good number of people were at that very moment on their way to attend the soireé of Spanish romantic-era music and kundimans, rendered at the Bayleaf, a beautiful boutique hotel in the heart of old Intramuros, by young classical violinist Joaquin “Chino” Gutierrez and his renowned accompanist, Mary Anne Espina. A number of those who had planned to attend the soireé worried about the mass pro-Duterte build-up at the Luneta and they stayed away. I left early for the music event, passing through Buendia Avenue where I saw folks in groups marching toward Roxas Boulevard en route to the Luneta, so I decided to turn right into Taft Avenue which proved relatively free and easy. I guided friends coming from Ayala Avenue to Taft and they made it to the Bay- leaf, but former SBMA Chair Felicito “Tong” Payumo and wife Daisy were not as lucky. They waded right into Luneta and got stuck there, and all Tong could do was text me of their sad fate. They missed a beautiful evening of enchanting music indeed. Thinking about our mass movements 31 years ago as we tirelessly marched up and down Ayala Avenue every Friday afternoon--amid all the confetti shredded from innumerable yellow pages of phone directories raining down from the buildings, in our herculean attempt to bring down the dictator---I realized how the yellow crowd then had inconvenienced so many people and establishments. Now the shoe is in the other foot. In an earlier post in Facebook I recounted how revolutions inevitably devour its children. As a thoughtful reader posited to my FB post, our case mirrors that of many other prior revolutions, most notably the French, Russian and Chinese Revolutions. Earlier, a number of FB readers pointed out that the arrest of Sen. Leila de Lima is KARMA indeed, after her persecution of President GMA and CJ Renato Corona. To my mind, however, looking at the broader picture, it's not just karma. It's also yet another case of the popular saying that "REVOLUTION DEVOURS ITS CHILDREN." This thought came to me on the eve of our EDSA REVOLUTION which culminated on Feb. 25, 1986. Our revolution continues to the present---a revolution cycle---and it continues to devour its children from various angles of the political spectrum. The question is, WHEN WILL THE CYCLE END? When will our country settle down and discard this karmic BOOM AND BUST CYCLE? Consider: The EDSA Revolution devoured Ferdinand Marcos, but the lead perpetrator of that revolution, Juan Ponce Enrile, was in turn devoured in his own time, ending in prison until he was released for humanitarian reasons.In a way EDSA Heroine Cory Aquino was devoured too, because she lost a lot of her own following due to the gross mistakes of her son Benigno Aquino III. Then the Revolution devoured Joseph "Erap" Estrada over the "second envelop" drama after three years at Malacanang, and Vice President Gloria Macapagal Arroyo ascended to power and stayed for nine years. But soon after finishing her second term PGMA was arrested by the vengeful regime of President Aquino III and placed under hospital arrest for the next five years--- though at mid-year of 2016 she was acquitted of the charges against her and is now gloriously resurrected as Deputy Speaker of the House. PGMA's Chief Justice, Renato Corona, was devoured too, succumbing to the vengeance of Benigno Aquino III on the Hacienda Luisita issue, with Leila de Lima as Aquino's hatchet woman. Now De Lima is herself devoured and there's speculation about Noynoy Aquino reaping the same fate as his Justice Secretary for his illegal use of DAP---to bribe senators during the trial of CJ Corona---and P-Noy's culpability in the Mamasapano tragedy. Will the Revolution ultimately devour the man in Malacanang, Rodrigo Duterte, as wild speculation is going about a "destabilization plot?" Or will the political boom and bust cycle end here and now---and we enter a glorious age of peace and stability which we so ardently long for our children and children's children, and which we pray for to the Lord of History? Indeed we long for peaceful transitions into power, where past officials gracefully yield to the incoming officials sans the sense of vengeance in their heart and WHERE THE RULE OF LAW PREVAILS ABOVE ALL---giving us citizens the enviable sense of pride in our country and leaders that other peoples have in theirs (exempting, of course, what majority of the Americans feel right now toward their new president), and in our maturity as a people. ALL THESE, INSTEAD OF WHAT MANY OF US FEEL IN INTERMITTENT INTERVALS---THE DESIRE TO SATISFY OUR LUST FOR VENGEANCE. When oh When, pray tell? Like Mark Anthony at the bier of Caesar, let us weep until we find the answer and our beloved Philippines rises gloriously from the ashes of ruins.